A strike plate is the metal plate screwed to your door jamb with a hole for the bolt of the door-lock. When the door is closed, the bolt extends into the hole in the strike plate, and holds the door closed. Since the door jam is usually soft wood, the strike plate ensures a more secure latch. The problem is, the majority of door-lock strike-plate’s are installed and screwed into the door jam with SHORT SCREWS. A door can be easily kicked in if it has strike-plate screws which are only about 1-inch long (often typical). It is an easy task to replace the existing strike-plate screws with longer screws, say, 2 or 3 inches long. All you need are the screws and a proper sized drill-bit to pre-drill deeper holes. Doors are often framed with two layers of 2×4’s, so a long screw that penetrates into both of them will help A-LOT… Look for #8 x 3-inch screws or thereabouts… whatever fits your plate. Just be sure to use a flat-head wood screw so that it will fit flat to the surface of the strike-plate and not protrude out (which would otherwise snag with the door when closing it). 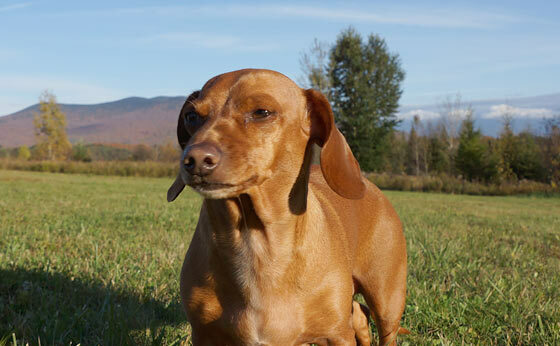 Having a dog should almost go without saying…that they are a very good burglar deterrent and home-security protection. The bark of a BIG dog may sound threatening, but even the yip of a smaller dog will bring quick attention to the situation and likely stop a burglar break-in because the typical burglar will move on to easier opportunities instead. 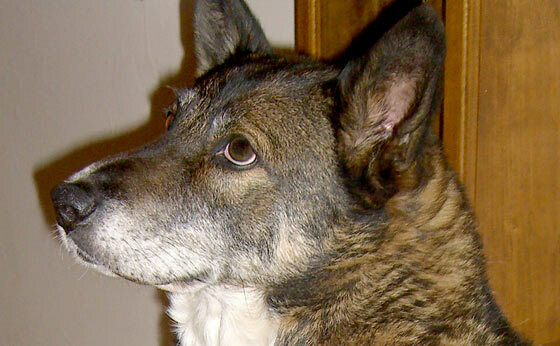 The dog pictured above (Akita-Shepard mix) was my best buddy for 15 years of his life, a big dog who would surely scare the wits out a burglar with his bark and threatening nature (to strangers who aren’t part of the known accepted ‘pack’ of humans). 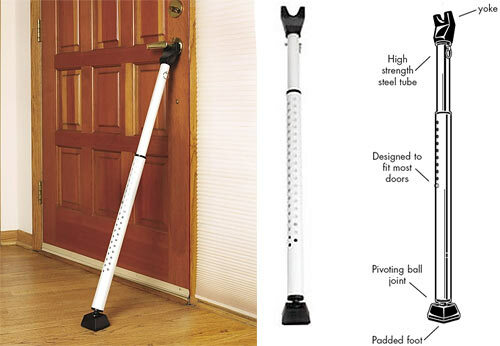 This door security bar may be the quickest and easiest way to keep a burglar from kicking in the door. They would literally have to destroy the door to get in because this bar will grip so tightly such that there’s no way the door is opening in a conventionally forced manner. You just tuck it under the door handle. Simple. My late dog,and close friend,Sandy,was part Labrador,part border collie.Smart as anything,could read your mind.And lovable as hell,but a real shy,nervous dog.But her bark,at the slightest noise,sounded menacing!Great home security when my elderly mother was home alone with her.RIP Sandy! I agree completely with that BUT dogs ALSO have very short attention spans. Most dogs when seeing someone walk by simply perk up their ears and stare until he/she leaves or they get bored.But some do bark too and when they bark THEY DON’t STOP unless told to. But, I know this has nothing to do with HUMAN break-ins, when faced with a supernatural force thats quite strong and powerful the dogs may bark and then flee whimpering with there tails tucked between there legs. Cats don’t do much protecting but still do react loudly and maybe even violently, to ghostly forces which, in MOST cases, don’t need doors or windows to enter. But some are only able to enter when an “invitation” is made such as opening a door or window for them. Demons don’t care, they do what they want when they want. She heard 2 men trying to break into my car one night! She always slept on my bed,as I am divorced and allowed her to.My ex would never have let her!The lights went on,I ran down to my car,and they had fled when her barking started.They did not get my car thanks to her! You should train your dogs to only eat food after they hear a word of some kind. You should also have it say on the dogs collar that he/she will eat after hearing the word. In case he runs off by some chance. So someone that find him/her could feed it. Along with the name and address phone number. Hopefully it would counter people from trying to poison guard dogs. It happened a lot during the Argentina economic collapse. Or so I’ve read. a dog is Good… great. we had a Bernese Mountain Dog, big enough all on his own (126 pounds), but whoa, pretty intimidating standing upright on hind feet, with top legs / paws stretched up vertical. man broke into our back yard, and kid was home sick and alerted me “someone in back yard” “dog is barking”. looked out back door, and there was dog, totally upright and literally circling this man while the dog was on hind legs. man was literally whimpering, and tears in eyes, and begging me NOT to let dog eat him. asked how he got in, and he said he broke the catch on gate (was pounded in with wood and nails)…told him he better run fast as the police were on their way. thing is, i hadnt thought to phone police before i spoke to him, and there i was a little concerned my dog might at some point “sit”, and this fellow would realize he was not man eating. fellow lit out quick, and then i did phone police. oh, dog is good, but please do not have a dog door. if your dog can get in, so can burglar. if door is smaller, burglar can still shove stuff through door, etc. There are two main categories of burglars: 1) the desperate amateur and the professional. The professional began burglarizing homes a long time back. He’s cautious. He doesn’t want to get pinched by the police. He’s good at his trade and so has found a fence for his stolen goods. He spends very little time inside your home. He generally watches for intelligence than no one is home, then spends time creating a plausible reason a person would pull up to your home, then burglarizes your home when there are less people in general around your neighborhood. He might not even be armed, but might certainly take a weapon of opportunity within your home. The desperate amateur has fallen on hard times. Maybe he’s never burglarized a home before. He’s likely to act impulsively. He’s likely armed. He’s likely to be a drug addict. The desperate amateur is the worst because he’s got to have something to convert into cash so he can get high or pay his bills, and so will take ridiculous chances. Door locks keep out honest people. Practically anyone can pick a door, but why do that since it’s easy to make a bump key. If you can bar the door from the interior with brackets and a bar of wood or steel, then many burglars will go elsewhere. It shows strength, resolve, and possibly an armed homeowner. A door is so much harder to gain access than a window. Windows can be broken easily but are loud. A neighbor seeing someone enter a door might assume they’re supposed to be there (especially if you are not on good terms with your neighbor or they don’t know you). It’s easy to cut glass, place duct tape on a window, and then gain entrance. Heck some windows are ridiculously easy to gain access by flipping the window latch with a tool. Sliding glass doors can easily be knocked off their hinges unless barred. In a collapse, far more desperate amateurs might be trying to break in. They didn’t prepare and so they’re going house to house and looing for homes that have been abandoned. That doesn’t mean they’re bad people. In fact, they might be normal people but by circumstance are trying to survive. If you end up dealing with those kinds of folks, then actions speak louder than words. They won’t be open to negotiation. Their goal is survival so if they think that it’s too much trouble, then they’re more likely to go on to an easier and possibly uninhabited home. During wartime, it was common and will be common for survivors/refugees to seek shelter in a home that doesn’t belong to them. One could bug out to a remote cabin and find refugees inside. Think about that, for the actual owner is trying to gain entrance versus interlopers. I cannot fathom why every American isn’t armed with a variety of weapons. In the history of humanity, that has been the norm. We’ve been lead to think by the media that civilized people don’t arm themselves, however statistics demonstrate plummeting crime statistics when more armed folks live in a region. It should therefore be common sense to clean your weapons, practice with them, have sufficient ammunition for them, take classes, etc. They are merely tools. Unfortunately here in Canada,the use of firearms for self-defense is,stupidly,big trouble for you,even when the case is legit!I do not own a firearm,currently,that is.I am well versed in unarmed combat,as well as combat stick and knife usage,so I at least have that to fall back on.As for the ridiculous firearms regulations here,hopefully that will change! There are movements afoot to lobby like-minded politicians for changes to our gun laws. You have to do what’s best for you, but I would not live in a region like that. That form of law only benefits criminals. Law enforcement comes AFTER a crime. They seldom can prevent a crime as criminals are not detered by their presence. Even that is very sparse protection. After your family is assaulted and killed, then they can collect the evidence. Wow. What a stupid form of law. It is like no law at all, for there’s no guarantee of justice whatsoever. Thankfully I don’t live in that kind of repressive region, though there are very repressive states in the USA and particularly in some urban regions. There are strong benefits to living in Canada, but practically all of them are outweighed by the pragmatic fact that you can’t protect yourself. Solution: Shoot, shovel, shut up. The three S’s. I like it. So technically you’re advocating murder, then covering up your crime? That’s not self-defense…and taking “stand your ground” laws to the extreme. How often do criminals tell others “I’m going to rob 123 Nicehome drive today. Call the police if I don’t come back by morning”? Involving police is largely your decision, especially in a SHTF situation. You have nothing to gain by “doing the right thing”. The just-us system will try to crucify you if at all possible. Just ask George Zimmerman. Our late dog was a Rottie, and she had the most intimidating act. If she didn’t know you, she would stand completely motionless staring at you, while you could barely hear a very low rumble in her throat. She did that one time while a contractor was working on the outside of the house. He was on a ladder above the window that she watched him through. He said he was never so scared. Here are two ideas for improving security for your family. A long time ago, it was possible to remotely trigger electronic relays and thus apply power to devices or switch on circuits. The common form was to turn on a series of lights in designated places, and one could also plug in devices into certain outlets and leave them in the on position, then when the remote buttons were pressed, those devices would be powered up. I used these remote switches and outlets to assist a family member who would arrive home late at night and to an empty home. Then by pressing the remote, many lights would come on, and if afraid other things might happen like turn on an alarm. That remote could sit by the nightstand, and if anything was amiss, then again lights could be triggered on plus the alarm. I believe they still sell these, and they take a minimal amount of craftsmanship, and though it can be computerized, it need not be. That’s only good if the power is working. However, should the user try to remotely turn on the lights from outside the home, and should the lights not come on, then it’s always possible that someone killed the power and the user would be alerted to be cautious or escalate their concern. If the user pressed the buttons in the middle of the night to turn on the lights and they didn’t come on, then they’d know there was no power and again be alerted to that fact and arm themselves. It was a good inexpensive alarm system that 99.9% of the time was used to allay fears and simply turn on lights before entering a home, or when a noise was heard within a home and to turn on multiple lights at once. I promise it took a minimal amount of time to install, so if you can install a light switch or an outlet, then you can do this installation. There are personal alarms that when pressed emit a high volume annunciator. It shrieks when pressed and needs no power. That system can be utilized to rapidly alert everyone that something is seriously wrong and faster than trying to wake everyone up, and would likely startle many intruders. This is a very inexpensive way to help improve security and also give peace of mind to your spouse. This is not an endorsement, only to assist anyone who’s looking for similar devices as I described above. There may be much better solutions today that fits your needs. The devices I used belong to the X-10 home automation family. Earlier this year my black labrador woke me up at around 2AM. I grabbed my gun, made ready, and poked the blinds to see a car speed off. There was no damage to the vehicle! The next afternoon a lady who lived down the street was passing out flyers letting the neighborhood know that her and her neighbors car had been broken into last night. I told her what happened to me and she said her and her neighbor did not have a dog. Proof is in the pudding! Thanks for sharing your experience… the proof is irrefutable! I can’t help but laugh when I see advertisements for home automation systems that allow doors ro be unlocked via smartphone, etc. If you can do this, so can somebody else. As far as burglary via computer, old-school door locks are 100% hackproof. One simple rule can thwart most buglars–Don’t make it easy for them. I have two dogs, and like most of us we trained them to be friendly,loving family pet’s. So when our house was broken into they barked like crazy and the robbers locked them in the master bedroom. I heard them barking like crazy when I got home, that is really what tipped me off that something was wrong. Then I saw our backdoors open and called 911. At first I was upset that my dogs would let anyone in the house then I realized that I had raised them to be loving and friendly to all who entered our home. My bad for not having security dogs who were taught to defend their home and family. My animals were freaked out by the whole thing as was I. Their emotional state after the fact was nervous and a bit scared. I never thought about my animals emotional response to that kind of situation. I hope that no one in this house has to go through that again. I am a bit paranoid that they(robbers)will come back. We can expect the dogs to be nervous and shaken after something like that. I’m sure mine would be too. Most of the time dogs will make burglars look for an easier home to rob. Sometimes just putting a “Beware of the Dog” sign up can do that. They are mainly going to serve as an alert. If you are worried the burglars might come back, there are plenty of alarms you can buy and setup that will dial you if tripped. Have you considered taking a firearm safety class, then purchasing a firearm? I’d get a couple of dogs. They don’t require electricity, remote motoring, etc. They do require lots of love and play. Any dog not socialized as a pup to outsiders not from within the Family Pack will alert to strangers.The trick is to not allow exposure to anyone not a household regular(CLOSE relatives,best friends etc)….keep the dog away from casual visitors,if you allow such in your home.Having such a dog/dogs requires a little extra care but will pay off in a crisis. My two Shepherds were allowed only contact with my wife, our two kids and one best family friend.We never “trained” them to beware of strangers but they are the most awesome watchdogs alive. I agree that any dog is better than no dog but if you are planning on your dog(s) as a leg of your home/family defense plan Id suggest a little care in the selection of the breed. i met this person online he has cleaned me out. I had dead bolt locks and got security doors. I notice he carved around the door. however, he got in several time. he knew when i left home and when i was returning. i went to police and because i can’t tell them how he got in they dismissed it. i sold my home and moved away. he followed me. he got into my new condo and with his daughter and son raided my condo. now i am afarid to leave home. the law won’t help cause i can not tell them how he is getting in. i was crying and upset the officers ask me was i taking meds. what an insult. wouldn’t anyone be uoset in my position. what is wrong with them? they think i need mental help. i feel like a prisoner in my own home. i just retired and my life is hell. the person lives in youngstown oh. i have a maltese and he barks. the thief tried to befriend him when i was gone to the store and other errands. so i took my dog with me. if you have any suggestions or can help me please post it. thank you. GOD Bless You. 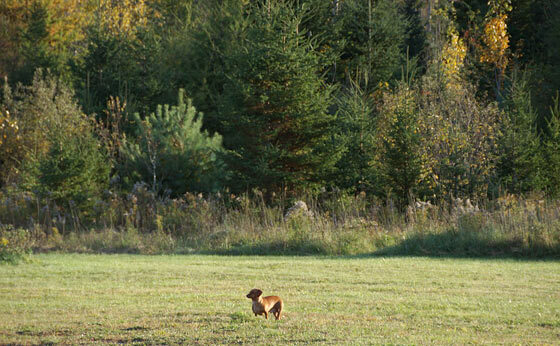 The Dachshund in the photo is a cutie, however my first thought was “coyote bait”. 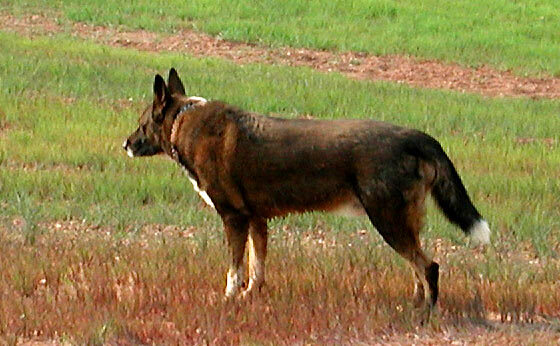 My suggestion regarding what kind of dog to get is: Get one that can fend off the local varmints and predators both 2 and 4 legged.